At the southernmost point of the South American continent, the mighty Andes dissolve into a few rocky islands in the sea. 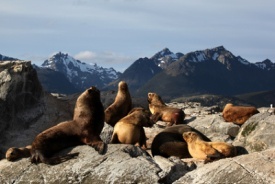 The islands of Cape Horn's shingle beaches and steep cliffs support a variety of birds, including kelp geese, steamer ducks and black-bowed albatross. For sailors throughout history, Cape Horn has been and remains awe-inspiring -- it is the confluence of the Atlantic and Pacific oceans, where nature's power is often unleashed.